A mentor or coach is an advantage that the best in business use. Jeff Martin, CEO and founder of Jeffrey Agency and University Recruiters, knows a thing or two about mentorship. He has coached thousands of aspiring and new entrepreneurs. New York, NY, April 04, 2018 --(PR.com)-- Warren Buffett, a self-made billionaire and one of the world’s most influential business investors, once said, to be successful in business you need an unfair competitive advantage. Mentorship (or coaching) is that competitive advantage. Buffett has lived his life as both teacher and student. At the 2017 Berkshire Hathaway annual meeting, he explained that if he can be remembered for one thing, he would like to be remembered as a good teacher. Moreover, Buffet credits his career success to the mentors in his life. His three greatest “teachers” were his father Howard Buffett, his late first wife Susan Buffett and his mentor Benjamin Graham. If Buffett doesn’t convince you of the importance of a good mentor, consider Martin Luther King Jr. His mentor was Howard University professor and U.S. diplomat Ralph Bunche. Talk show host extraordinaire and billionaire Oprah Winfrey’s mentor was renowned author Maya Angelou. Soccer legend David Beckham sought coaching from his mentor, president and CEO of Maple Leaf Sports and Entertainment, Tim Leiweke. Every major athlete, movie star and political leader has had some kind of teacher whose footsteps they followed in. Guess what? A successful business person should too. A mentor or coach is an advantage that the best in business use. Jeff Martin, CEO and founder of Jeffrey Agency and University Recruiters, knows a thing or two about mentorship. He has coached thousands of aspiring and new entrepreneurs. As a leader in the staffing and recruiting realm, Martin has built his brand as a staffing expert by honing his staffing knowledge, recruiting expertise, and career coaching experience. Today, recruiters from all over the world look to him for training and mentorship. 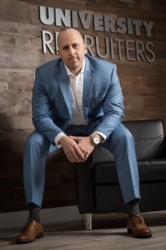 Both of his companies have grown to become nationwide recruiting firms that handle staffing for some of the most prestigious companies in the country. Martin built his brand from 0 to 7 million weekly views in a year. He is also one of the most sought after coaches and mentors to Fortune 100 and 500 companies for hiring strategies. Martin’s success in recruiting and coaching shows the value of a good teacher in business. Starting a business can be tricky business (pun intended). There are bound to be obstacles, setbacks and questions along the way. If you are going to launch out into an entrepreneurial career, why do so without the wisdom, knowledge and resources of someone who has done it already? Here are a few benefits of mentorship in successful business Martin uses all the time. 1- Mentors offer experienced, objective and fair feedback. A business coach can act as a sounding board and offer perspective on your choices. It never hurts to have a second opinion in business matters. Talk your ideas and questions through with your mentor. Perspective is key. Advice from a mentor can help you avoid wasting time and energy on concepts that your mentor has already tried and failed in or give you a shortcut to a successful path. You save time, money and resources by learning from others’ mistakes. A mentor serves as living, breathing example of what not to do. They can tell you first hand what works and what absolutely doesn't work. 3- A mentor challenges you to reach your potential. Listen, ask questions, learn, implement what you learned, ask for feedback and watch your growth. A mentor’s wisdom and experience can help catapult you and your business to new levels of success. 4- You grow professionally and personally. A good mentor helps you grow in your career but also in your personal life. Afterall, a business can’t run successfully if its leader is unhealthy mentally, physically or emotionally. True success is won when both you and the business run on all cylinders. Mentors give you advice and wisdom when one arena of your life is out of order. 5- Mentorship helps build your network. In business, it's all about who you know. Chances are your mentor knows more tenured and experienced people in the realm of business you are interested in. Your mentor can serve as a connection to other business leaders and offer great networking advice and suggestions.